Born in Treviso on 5 January 1970. Degree in law in 1995 at the University of Bologna. Enrolled in the Order of Lawyers of Treviso since 1999 and in the Register of Patrons in Cassation since 2016. Enrolled in the AIAF (Italian Association of Lawyers for the Family and Minors) since 2008. 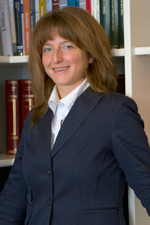 She has participated in various in-depth courses on labor law and family law (for example: Arbitration course at the Chamber of Commerce of Treviso, 1999; study meetings on separation and divorce organized by the Court of Treviso, 2002; of specialization in labor law, 2005, organized by Ipsoa, day of study on “Mobbing, discrimination and existential harm of the worker”, 2005, organized by the European School of Economics, seminar on the theme “Knowing, preventing and managing mobbing” organized from the Order of Labor Consultants of Treviso, 2007, a training course in family law on the theme “Disruption of the legitimate family in fact: aspects of substantive and procedural law”, 2008, organized by the AIAF). Areas of specialization: International private and procedural law, Labor Law, Family Law.